It goes by many names -- t-bar ceiling, suspended ceiling, drop ceiling, acoustical ceiling -- but no matter what you call it by, there are some serious benefits to installing one in your basement. You see them all the time in offices and commercial space and many people are hesitant to consider them for their own home. One of the most obvious perks of a t-bar ceiling is the easy access to elements of your home that need periodic maintenance, repair, or attention. Drop ceilings allow you to get into shut off valves, electrical panels, and plumbing drain cleanouts simply. Especially when your home has aged plumbing, electrical, or ductwork, it’s a smart choice to maximize accessibility. Without a suspended ceiling, exposed plumbing, wiring, and duct work is a persistent eyesore. When hidden behind a drywall ceiling, it makes for a destructive and time-consuming process to access for maintenance and repairs. With a t-bar ceiling, you can simply remove a ceiling tile when maintenance issues arise. If a leak causes damage, you can simply remove and replace tiles! If you are building a new home or finishing your basement, a suspended ceiling is a practical choice to save time and hassle. Unlike drywall, installing a t-bar ceiling in your basement won’t make a dusty mess. The process is fairly simple, compared to other construction and home improvement projects. Installing a drop ceiling is one of the easiest ways to enclose a ceiling for a livable basement area. Compared to drywall ceilings, which will take multiple days to hang, tape, prime, and paint, a t-bar ceiling can take less than a full day. Yes, those are all t-bar ceilings. The best part? If you’re the type to get bored of home decor quickly, you can easily swap out different ceiling tile designs. No need for hassling with painting or construction. In Vancouver and beyond, homeowners are increasingly converting unused space into revenue-generating rental suites. Installing a drop ceiling makes managing and marketing your rental suite simple. T-bar ceilings take less time and effort to install than a drywall ceiling, meaning you timeline to getting that first rental cheque is shorter. They also allow easy access for maintenance and are inexpensively replaced if damaged so you don’t have to worry about any mishaps. 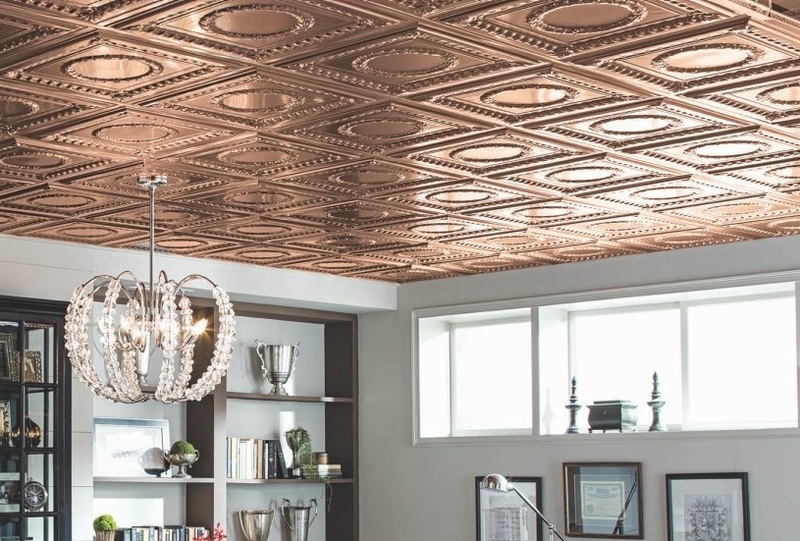 Plus, ceiling tiles have design options that will make your basement rental unit a very desirable choice for renters and help you draw top-dollar! You can make your basement into the space you’ve always dreamed of having. Want a home theatre, a home gym, or playroom for the kids? You can have it! The rest of the house won’t be bothered by the noise of what happens in the basement. Acoustical ceiling tiles are made of soft, sound-absorbing material that inhibits sound transfer and echoing. Not convinced? Check out why soundproofing your basement suite is a must. Plus, you can easily run wiring for your surround sound, cardio equipment, monitoring system, or whatever other tech your heart and home desires. A drop ceiling makes it simple, more affordable, and less intrusive. If these perks convinced you that having a suspended ceiling might be a smart choice, we can help you out. The experts at Custom Drywall install t-bar ceilings across greater Vancouver. We can help you choose the right solution for your needs. Contact us today to request a free quote.